The party conference season has ended with no-one any the wiser as to how the British economy will get out of its current dire condition. At the beginning of this week - not good timing for the Chancellor - the IMF downgraded its growth forecast for the UK again. Three months ago it believed the British economy would grow by just 0.2% in 2012; now it predicts it will shrink by 0.4%. It cut its growth forecast for next year from 1.4% to 1.1% - over the two years, the largest IMF downgrade of all developed countries. Never wishing to offend the governments which fund it, the IMF stopped short of arguing for a change to the Coalition’s austerity policies; but in doing so conveniently overlooked its own view of just one year ago. Then it had predicted growth of 1.6% in 2012 – and said that if growth were lower than this a ‘Plan B’ would be needed. As expected, George Osborne made clear in his speech to the Tory Conference that there would be no such thing. Lashing himself to the mast of the good ship Plan A, he declared that only austerity had kept interest rates low, and any stimulus would cause them to rise. With bondholders now effectively paying the Government (in real terms) to allow them to hold UK debt there is frankly very little basis for such a claim. But the Chancellor’s macho stance, begging the conference to hear the echo from Mrs Thatcher’s ‘the lady’s not for turning’, has so painted him into a corner that politically he had little alternative. With consumers fearful and investors holding onto their cash for lack of demand, the British economy remains at the mercy of the Eurozone crisis and the faltering economies of the US and China. It is very hard to see where growth will come from any time soon. Yet perhaps the most devastating announcement from the IMF this week was that it had revised its calculation of the ‘fiscal multiplier’, the amount by which GDP falls for every pound that public spending is cut. Where before it had estimated that every cut of £1 took 50p from GDP, now it believes that the figure is actually between 90p and £1.70. As the TUC immediately pointed out, taking a figure from the middle of this range would suggest an extra £76 billion has been sucked out of the UK economy by the Coalition’s austerity package. It is not hard to see why the UK went back into recession this year. David Cameron in his speech looked more long term. In a strikingly pessimistic passage about increased competition in the new global economy, he argued that Britain was at “an hour of reckoning.” We faced a stark choice, he said: “Sink or swim. Do or decline.” The Prime Minister should be given credit for acknowledging that Britain’s economic problems are not just short term, and not just about sovereign debt. They concern the very structure of the British economy, with its too-small manufacturing sector, dysfunctional banking system, low rates of R&D and long tail of inadequate skill in the labour force. 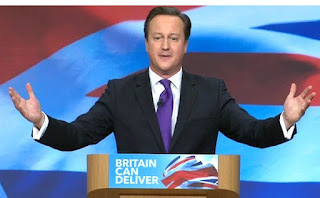 But neither Cameron’s nor Osborne’s speeches contained any significant ideas for how such weaknesses can be addressed: it is fairly clear that neither more reform to the planning system, nor Osborne’s imaginatively right-wing plan to buy out employees’ rights at work in return for shares in their companies - more or less the only two policies proposed - are adequate responses. With even the CBI and engineering employers the EEF now calling for a more active industrial policy to help British businesses face the global challenge, Labour should be in a position to capitalise. Yet its own conference produced little more than slogans in this area. Both Ed Balls and shadow business minister Chuka Umunna argued for industrial policy, committed Labour to a British Investment Bank, and stressed the need for better skills training, but there was little detail on any of them. Serious work is no doubt going on behind the scenes, but it remains a real challenge for the Opposition to spell out exactly how a more activist approach to economic policy would transform the UK’s medium-term growth prospects. Interestingly, there is one area on which both Conservatives and Labour agree. This is the potential for infrastructure investment to get the economy moving. Ed Balls proposed a Keynesian strategy of public investment in housing, paid for from the sale of 4G mobile phone licences, and announced a review of infrastructure needs to be led by the Chair of the Olympic Delivery Authority Sir John Armitt. Surprisingly, George Osborne failed to respond by pointing to the Treasury’s recent announcement of sovereign guarantees for infrastructure investment. Yet this is in practice the most radical economic policy currently on offer from anyone: using the Government’s balance sheet and triple-A rating to underpin private sector investment in infrastructure projects. Perhaps it is because the policy doesn’t accord with the Conservatives’ economic ideology – it is a naked intervention in the finance market which increases the Government’s contingent liabilities (another form of public debt) to ‘crowd in’ private investment. But anyway, if it can be made to work, we should be thankful for it. Now all it needs is for the Green Investment Bank to be allowed to borrow now to invest in low carbon energy and energy efficiency, rather than wait for 2015 as currently required, and the Government might even be said to have a proper stimulus strategy with which the Opposition could agree. How paradoxical that this would appear to run so counter to its austerity message that the government seems to want to pursue it by stealth.